I thought the results were pretty interesting, and looking at the graphs representing the responses of various groups, I had made some observations. It appears that a majority of Republicans are dissatisfied with the government while Democrats feel the opposite, and independents seem to be even across the board, but when taking into consideration the direction to which independents lean, it appears that those with a conservative leaning are disproportionately dissatisfied with the government when compared to their liberal counterparts, who seem evenly divided. I also thought it was interesting when taking into consideration the views of those who agree with the Tea Party. 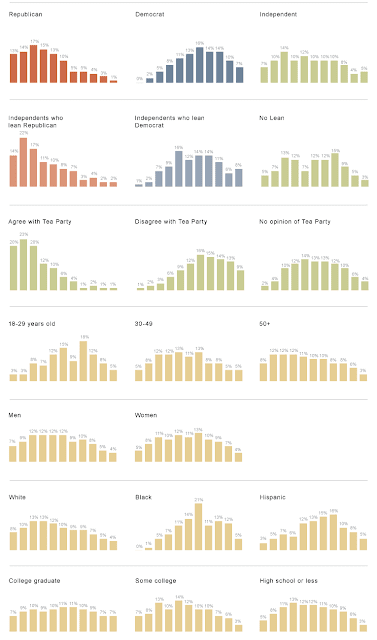 It would appear as if conservatives, the GOP, and the Tea Party are the crux of discontent, while liberals, Democrats, and those with no political leaning or opinion regarding the Tea Party have a more evenly distributed satisfaction level. When looking at the numbers that surround the age of the responder, it appears the younger demographic is more satisfied with the government. I also thought that the results surrounding race to be interesting, where as minorities seemed to have a more positive view of the government then Caucasians. The final set of graphs, regarding education, seemed interesting as well, because it appears that while those who have completed college to be more evenly distributed, those with some college education, a high school education, or less, seem to hold increasingly dissatisfied views of the government. A simplistic way of looking at this graph, it would appear that conservatives have had a more successful impact on persuading the less educated, and that result surprise me, because the policies of the GOP and the Tea Party seem to contradict the interests of those they claim to represent. I thought the questions asked of this survey to be balanced, and by my results, which were answered honestly, to be interesting as well, especially when compared to the other group's responses.